Since the introduction of Ketron's incredible PA system we have been asked for a smaller, pocket friendly alternative. 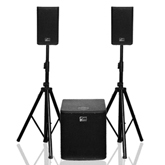 This has not been easy, as unlike most keyboard instruments, the Audya's live elements require a full range PA system with good mid range (something lacking in most modern PA systems) We finally have two recommended system. The Solton "Pro Sat 1800" featuring Bang and Olufsen amplification and Solton Pro Sat 1200" with smaller sub for easier transportation. With a retail price of £1199 for the Pro Sat 1800 and £1149 for the Pro Sat 1200 we will be offering these systems to our Ketron owners at a greatly reduced concession price of only £899 and £799 respectively. This includes the Active Sub powering two passive tops via Speakon Cables. These systems are very close to Studio Reference Quality and you will not be disappointed.